The Audioengine HD Series was designed for the way people listen to music today and HD3 raises the bar and sets a new standard for compact mini music systems. HD3 fits just about anywhere you listen and was designed to play all your music from any device. Easy setup, simple but useful features, and real stereo sound make HD3 the go-to system for all your music! HD3 is designed with multiple inputs to accommodate all your digital and analog sources. HD3's Bluetooth receiver, which supports aptX and AAC codecs, has a range of about 100 ft so you can stream all your music from almost anywhere in your house. Its USB input bypasses your computer's lower-quality DAC for a high-fidelity listening experience. Lastly, dual analog inputs round out the HD3's impressive suite of connections. Stream TIDAL, Spotify, Pandora, YouTube - or any other streaming service or media player - wirelessly from your smartphone, tablet or computer. And for the highest resolution connect to the USB input. There are connections for a turntable and even a subwoofer, plus a headphone output and volume control on the front panel. HD3 was designed first for audio performance, but speakers also need to look great. The furniture-grade wood veneers, aluminum trim accents, and detachable magnetic grills give the HD3 a look and feel of old-school elegance that blends with any decor. 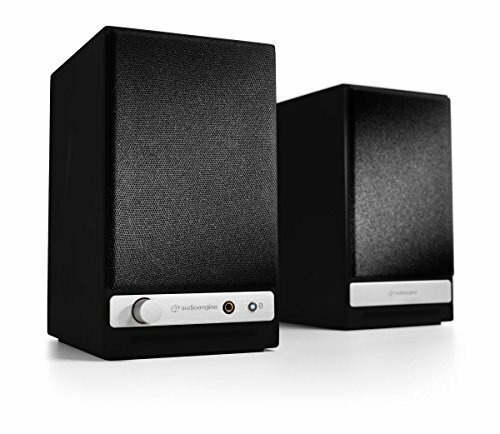 Built-in power amplifiers save space and eliminate the need to connect HD3 to a stereo receiver or external power amp. Simply plug the left speaker into a power outlet and connect the included speaker wire from the left to the right passive speaker. All internal components of the HD3 are designed and tuned together, so you'll get Audioengine's Signature Sound and a much more efficient system than traditional separate passive speakers and amplifiers.